For a trouble-free move to your new home, you can count on our experienced team of San Pablo movers. Meathead Movers is proudly staffed by professionally trained student-athlete moving crews in San Pablo and beyond. 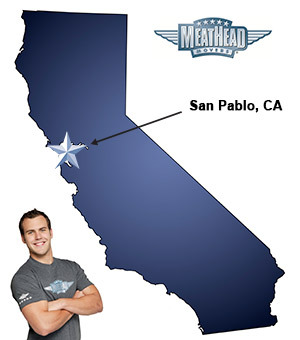 Welcome to Meathead Movers of San Pablo! If you are moving to or from San Pablo, our dedicated San Pablo movers are ready to handle the heavy lifting. With Meathead Movers’ professionally trained student-athletes and moving concierge service, we are here to help you with every stage of your San Pablo move. San Pablo is a town in west Contra Costa County with a rich history. Being a part of the greater San Francisco Bay Area, San Pablo is just a short trip away from large cities like San Francisco, Berkeley, and Oakland, but still offers all the benefits of a small town. Modern day San Pablo has grown a lot since its humble Spanish settlement roots. Today’s San Pablo is a thriving residential and business community with great shopping and dining opportunities. If a move to the area is in your future, trust our top-rated San Pablo movers to tackle the job. Our moving company specializes in local, long-distance, and commercial moves to, from, and within San Pablo. We also provide reliable packing, storage, on-site relocations, and our distinctive concierge service. All our student-athlete movers are thoroughly screened and trained before their first move. With branches not just in San Pablo, but all throughout California, we are your one-stop resource for all your moving needs. In fact, you can see what your neighbors in San Pablo have to say about us. With our 100% satisfaction guarantee, the only thing you have to lose is the stress that comes from moving! Contact Meathead Movers today for a free moving quote and learn how we can help you on your next move! Moving to San Pablo? Here are some helpful resources. View more San Pablo resources.